But if you try to select each chart individually and adjust the alignment, it may not provide correct results as charts / other drawing objects can be moved by pixels instead of cells. Here is a simple trick to ensure proper alignment. 3. You can also distribute charts evenly across the available space on the sheet using this menu. Btw, if you do not see “draw” menu, probably the drawing tool bar is not yet turned on. Holding the ALT-key pressed during moving or resizing a chart makes excel to autofit the position and size of the chart to the grid of cells underneath. This makes it quite easy to align several charts and ensure that they have all the same size. Works for shapes, form controls, etc. as well. Very nice trick for Dashboard Charts. A donut chart, a 3d column chart, and a 3d conic column chart. The best way to align these monstrous chart types is with the DELETE key. Your post does illustrate one of the great advantages of Office 2003 (and earlier) over Office 2007. That Align or Distribute submenu can be separated from the menu and dragged as a floating palette to wherever you may want to use it. Click on the top edge (see the border above Align Left?) and drag. 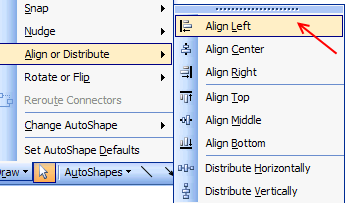 This and many similar formatting palettes were removed from the Office 2007 interface, supposedly to simplify the interface. The unintended consequence is that, for people who actually use this feature, it now takes two, three, or more clicks to carry out an operation that took a single click with the floating palette. Not only do you have ot learn where the commands are hidden in the new interface, it takes longer to actually use them. @Jon ... : "A donut chart, a 3d column chart, and a 3d conic column chart. The best way to align these monstrous chart types is with the DELETE key." I totally agree, especially with regards to the chart engine, I can’t hardly see any improvements Excel 2007 would have made. Far from it! In Excel 2003 or earlier you selected something on your chart – let’s say an axis – went to the format dialogue and changed several things, e.g. the font type, the font size, the scale, …, and finally the line color. Then you selected the other axis or the axis of another chart, pressed F4 or ctrl-Y and Excel repeated all changes you have made to the axis in your step before. A time-saving feature, especially if you have to format a lot of charts, one after the other. With Excel 2007 F4 only repeats the last change you made. In the example above: only the line color. You have to do all the other things again. Does Microsoft really think this would be an improvement for us? Yep, the loss of the F4 key is another productivity-sapping "unhancement" in Excel 2007. The modeless dialogs at first seemed like a good idea, but on second thought, I want the old dialogs back. While we're flaming on the new UI, how about the tabs on those dialogs. There are four tabs covering markers and two covering lines, whereas Excel 2003 had one tab for lines and markers. It's so much easier to format the series if you can see all of the controls on one tab, rather than having to move from one to the next. - why doesn’t double clicking on a chart element bring me to the format dialog anymore? - why do not all number custom formats (that are defined and available for the cells) show up in the number format dialog of a chart? And what is that extra add button for? I don’t have to do an extra click on an add-button when defining a custom number format in a cell. I have to admit that I didn’t search for a user discussion focused on the Excel 2007 chart engine. Maybe you want to think about starting one on your PTS blog? I think you as an MVP and your website / blog as the number one reference for Microsoft Excel charts on the internet would be perfect for starting such a discussion. If there is already such a discussion, please let me know. @Chandoo: No offence! You know that I love your blog and try to make some humble contributions to PHD wherever I can. But I think in this case Jon’s PTS blog would be the perfect place for a discussion dedicated to pros and cons of the Excel 2007 chart engine. I'm sure Google will help you find more. Can you please suggest on how to center align the images in Excel cells? Hunted a lot, but couldn't get a solution..